Yukako Yagi and the team behind The Warren Alpert Center will harness the advantages of new imaging capabilities for both clinical cancer care and research. 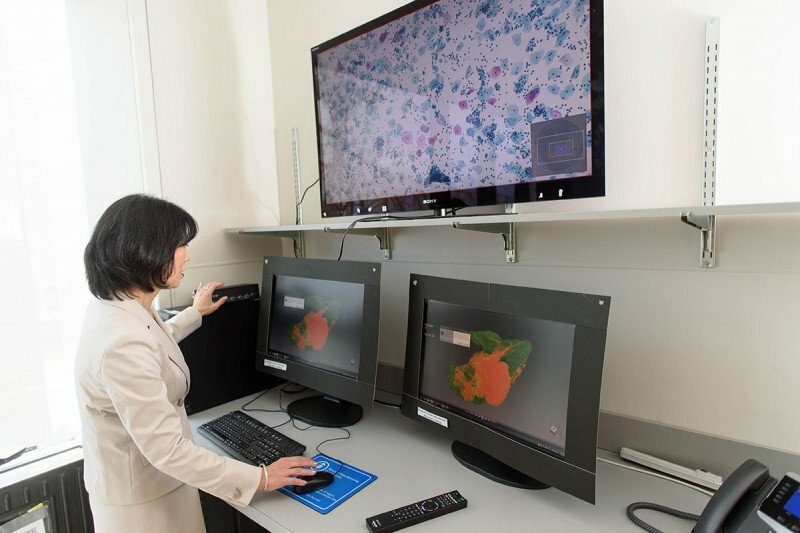 The Warren Alpert Center for Digital and Computational Pathology was established in 2017 as an innovation center to facilitate novel research and development in digital pathology and algorithmic computational pathology for clinical cancer care and research. It also serves as a hub for existing digital pathology efforts to establish a fully digital workflow in MSK’s Department of Pathology. Completely dedicated to cancer diagnosis and research, MSK’s Department of Pathology is one of the largest in the world, with a massive archive of glass slides and pathology information dating back more than 40 years. The department’s faculty consists of world-renowned subspecialized pathologists, molecular diagnosticians, and researchers with expertise in a range of disease-specific solid-tumor types and hematopathology. Newer technologies and precision medicine have enabled improved diagnostic accuracy that can further classify cancers and identify specific genetic and epigenetic alterations that drive tumor growth. Precise histologic and cytologic classification and testing for clinically useful mutations in patients’ tumors allow for the matching of individual patients to the targeted therapies that are mostly likely to benefit them. The practice of anatomic pathology is still mostly based on the evaluation of glass slides of tissue sections or dispersed cells using a microscope, as it has been for 150 years. The capability of creating whole-slide digital images has existed for more than a decade but has yet to be embraced as routine practice. Consequently, the use of digital slides for higher-level computational analysis has been limited. Inherent in the use of glass slides are the logistical issues of slide transport, archiving, and retrieval, as well as limitations in remote review, conferencing, and consultation capabilities — challenges most pathology laboratories face today. Pathology as a discipline is also stymied by increased workloads and a shortage of specialists in some parts of the world. There is a significant need for tools that can reduce the burden and increase the precision of cancer diagnosis. Improvements in technology and recent FDA approvals have created the opportunity to overcome some of these barriers. The overlap between MSK’s expertise in pathology, digital imaging, and large-scale machine learning in a data-rich environment makes MSK the ideal place for The Warren Alpert Center for Digital and Computational Pathology. To facilitate computational pathology in practice, the team will build on a fully digital workflow and advance imaging techniques in digital pathology. Recent breakthroughs in machine learning and improvements in scanning technologies have enabled MSK to build decision-support systems that use deep learning and artificial intelligence at an unprecedented scale. The Warren Alpert Center combines these existing synergies and will build the resources critical for new developments in pathology. The overarching goal of The Warren Alpert Center is to lead the way in transforming pathology from a subjective, qualitative discipline to an objective, quantitive one. Memorial Sloan Kettering’s efforts to extend clinical services to off-site locations, the growing demand for consultation opinion provided by MSK pathologists, and the operational challenge of managing an archive of almost 25 million glass slides motivated MSK’s Department of Pathology to explore digital and computational pathology solutions. The engagement in digital pathology has been transformative for pathology practice. With the support of a gift from The Warren Alpert Foundation, the Center for Digital and Computational Pathology positions MSK as a major center for pathology digital imaging and computational pathology, providing a key component to the institutional focus on precision medicine. Though several other major institutions have begun programs in machine learning, digital pathology, or advanced imaging, few, if any, have encompassed all of these disciplines in a synergistic relationship with other clinical and basic disciplines as proposed by the Department of Pathology at MSK. The Department of Pathology has taken critical steps toward implementing a digital pathology workflow, building a high-performance compute (HPC) infrastructure, and making partners in industry to become a national leader in the development, integration, and advancement of digital and computational pathology. Under the leadership of The Warren Alpert Center, the department will capitalize on MSK’s extensive pathologic and genetic data to pioneer computer-augmented cancer diagnosis and to lead the transition of pathology from a qualitative to a quantitative discipline. Using its engineering expertise, the team will employ digital technology to explore novel methods for the morphologic evaluation of tissue samples. The Warren Alpert Foundation’s philanthropic support places MSK at the forefront of these major developments and their implementation.